One of the greatest gifts of this practice is a mind that can find the Dharma in any experience. There is no moment that is not a good moment for seeing clearly, for letting go, for cultivation, for freedom (which are the tasks associated with the four Noble Truths). Sometimes this is deliberate, when we consciously regard life through the Dharma lens. Waiting at a stop light: A chance to feel the pressure of the body against the car seat. The store is out of lemons: Let go and try lime. You are assigned to a contentious work team for the next 3 months: Practice never returning anger with anger. A gorgeous sunset: Even while letting its beauty infuse and nourish you, notice that each moment it changes and fades, and will be gone very soon. With practice, this becomes effortless – just the inclination of the heart. And there are nearly endless ways to find the Dharma in each moment. The arrival of sadness could prompt mindful attention and the naming of it. It could evoke compassion. It could be the seed for a quick investigation into the story associated with the sadness, and a release of taking that story personally. It could include no intentional action at all, just a pure whole-body experience of “becoming” the sadness, burning it away into the next moment. (The cell is my teacher. It has taught me the value of (Freedom). I think this kind of strength lies latent in all human hearts and can emerge in surprising ways when needed. In the Mahayana tradition, fear of suffering is considered a hindrance to the achievement of full Awakening. It is not that we wish for suffering – the aim is to end suffering – but the implication is that we must expect some suffering along the way, and it’s best to be completely willing to meet it, as the above inmate was. There are many skillful ways to meet difficulty and adversity (forms of dukkha), but perhaps we could make two broad categories: with tranquility and with action. Both are based in clear awareness. Meeting dukkha with tranquility means focusing on refraining from reactivity. We no longer meet every instance of unpleasant sensation by making an adjustment, acquiring something, or strategizing how it could not occur in the future. The first hint of thirst does not require a cup of tea. Getting into a hot car does not mean simultaneously opening all the windows, cranking up the fan, and blasting the A/C to maximize the speed of cooling down. A fast-paced day at work does not call for the “reward” of a piece of chocolate cake. On the cushion, we stop changing our position with each twinge. In other words, we increase our ability to handle discomfort – physical or mental – with poise, and without losing awareness. In interactions, we no longer get drawn into the unskillful mindstates of others. We are able to meet another person’s fear, depression, or even anger at us with calmness. The first impression might be that this sounds cold or disconnected. If we are simply blocking or turning away from their anger, that would be the case. But the verse clearly states that we are doing good – indeed, curing – with this attitude, so we can understand it to be a full acknowledgement and connection to their emotion, just not taking it on in a reactive way. The last section is significant. When practicing non-reactivity, you may actually provoke the ire of those who feed on others’ reactions. They want to get a rise out of you, and if you refuse, you are called a fool (or worse). The verses remind us that following the Dhamma sometimes puts our behavior at odds with conventional expectations. It’s up to you to choose where to place your loyalty: Your practice or societal expectations. Non-reactivity depends on having strong enough awareness that the urgency of reactions like anger, restlessness, impatience, and fear can be contained by calm observation. This not only increases our chances of making a skillful response, it also supports wisdom: It creates space for us to see what is causing that reaction to occur. Then we have the possibility of becoming free of it, or free within it. An alternative approach is to meet dukkha with action. Not reaction, but an active engagement that dynamically explores the conditions that are creating that difficulty and transforms them. 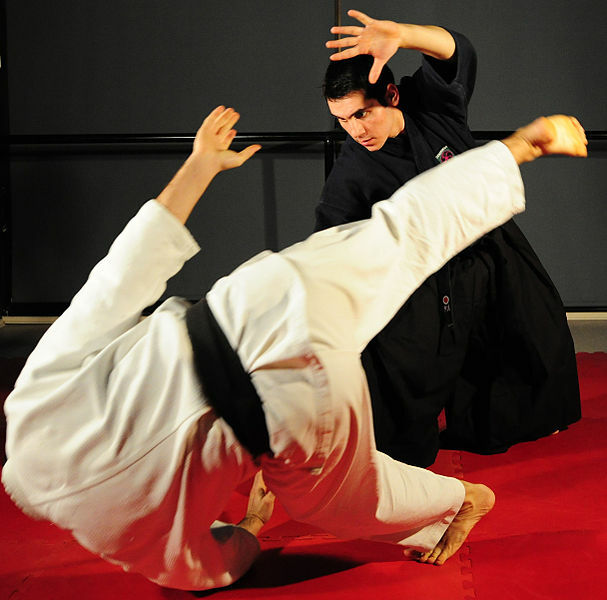 This method might be likened to martial art forms such as tai chi or aikido that meet and blend with the opponent’s energy to redirect it out of doing harm. Some prefer to think of it as a dance with experience. If you get fired from your job, instead of sinking into depression, how about signing up for a 3-week retreat that you could never do on your allotted vacation time? If you are unhappy about political polarization, how about setting up a table in a public place inviting people to talk freely with you about their views, without offering any of your opinions? You might learn a lot, and the act itself mitigates your concern. I heard the story of a village in India that gathered its resources to send a young man to medical school in the city. He ended up failing the medical boards and could not get a license. He came home, rented an office, and put up a sign with his name and the words, “Went to medical school, failed the boards.” People came to his office for treatment anyway. The man practiced honesty, humility, and the undaunted quality of compassion. Performing skillful actions like these depends on having strong enough awareness that you can notice whether your “redirect” is being successful – that is, whether your mind is actually moving away from attachment or identification. Some good cues are relaxation in the body, or a sense of wholeness or breadth to your experience (rather than narrowing). Also the ability to know what your current view or "lens" on the situation is; not knowing that often means it is subconsciously influencing you. Even the early discourses support using actions to become free. AN 4.159 points out that “it is by relying on food that food is to be abandoned,” meaning that we can take on “food” as a practice, really noticing what, why, and how we eat. Done carefully, this will show us how to overcome attachment to food. After all, we are not going to stop needing to eat! The same is said for obsessions of our mind, and even for conceit (which literally means comparing people, but I take it, for laypeople, also to mean identifying with a role). “Relying on conceit to abandon conceit” means to deliberately compare ourselves to admirable people and find ways to take on their good qualities. In the modern world where we have choices about what to “be,” this practice can also include trying out roles, positions, or jobs to see how we act – and get reactive – under those circumstances. I enjoyed serving as a cook for a couple of retreats in order to see how I behaved in a fast-paced kitchen doing tasks that required some agility and precision. When the Buddha was challenged by Mara, as in the picture above, he sat calmly without reacting when Mara teased him with objects of desire and revulsion. 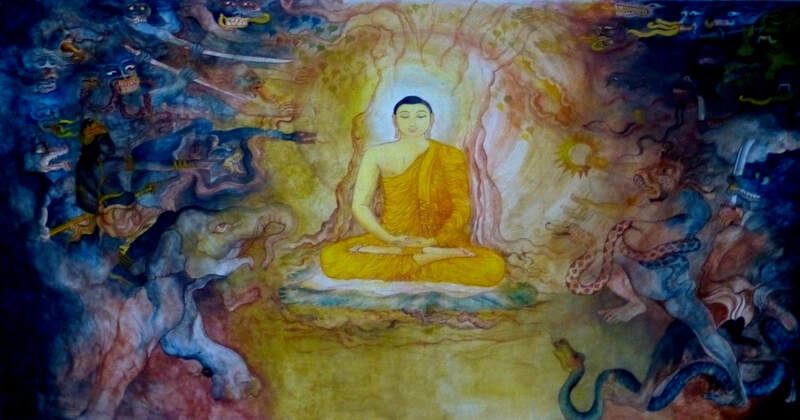 But when Mara attacked him with doubt – asking him what right he had to awaken – the Buddha took skillful action. He touched the Earth, affirming that he had full support and was completely ready. Gaining skill in handling suffering, with tranquility or with action, begins to allay the fear of suffering. If we know we have inner calmness or options for “redirection,” why worry? Life will unfold, and we will meet it, somehow. A mind like this lives quite peacefully amidst changing and not-very-controllable circumstances. I marvel that this is a fruit of sitting on the cushion and attuning to experience. The mind reshapes itself into an instrument that is more harmonized with the flow of life, which is actually what reduction of suffering comes down to. It’s so simple.